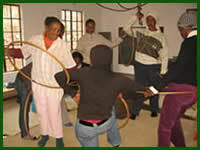 2dce9d&id=681095892 An article about Eco Saturday appeared in the Estcourt News and the Howick Village Talk. Check out our December feature in KwaZulu-Natal’s The Witness newspaper on Dalton Education Trust, psychomotor training, and the sustainable development vision of Dalton Private Reserve. To celebrate World Health Day on April 7, Dalton Education Trust began building a community food garden at the Dalton Resource Centre on the weekend of April 10. Working with Yizwa Centre for the Eco Arts, we are planting a permaculture garden, which is a long-term sustainable garden designed to minimize labor and waste and maximize use of natural elements. A few shallow steps will lead children into a fruit orchard and winter vegetable and indigenous plant garden. Then, instead of buying a weekly snack of fruit when the children come together on Thursdays, they can eat from a bounty of spinach, potato, onion, peas, peaches, plums, apples, and more! View a Yizwa blog entry about Dalton’s garden here. 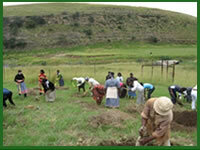 The garden is being built by everyone, and tended by our caretaker Nelisiwe Sithole. An article about the garden appeared in the Estcourt News. term, will have completed the practical portion of their training. LETCEE Family Facilitators will assemble learner portfolios and be assessed to receive state-sanctioned pre-school teacher certification. There have been a lot of training sessions, with weeklong trips to Greytown away from their families, and much more reading, homework and English than the ladies are used to, and they are so close to completion! We are so proud of our FF’s. Position: Coordinator of Family Facilitators (FF’s), which among other duties includes record-keeping, visiting and assisting Family Facilitators with crèches and psychomotor training, and liaising with the Dalton Education Trust Coordinator and the communities. Biography: The second eldest of seven children, Nokuthula lives in the rural community of Mhubeni, where she supports her father, a retired melamine-factory worker, her youngest sister and eleven-year-old son while also completing correspondence courses for a degree in Early Child Development and volunteering on the community-elected Dalton Education Trust governing Committee. She especially enjoys watching wild animal shows on television and singing in her local Catholic church, where the priests help her learn English. An avid chef, her father tends a vegetable garden and she does the cooking—nothing too spicy—and also keeps livestock, especially her favorite animal: the cow. 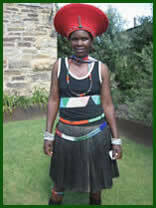 With a yen to travel, Nokuthula has not been outside of Kwa-Zulu Natal, and would love to someday see Cape Town. But right now she’s saving up to send her son to medical school someday. 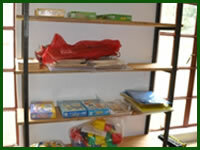 Since most of the community children will never own their own store-bought toys, we are so grateful that LETCEE www.letcee.co.za has busily been putting together an impressive lending library of learning toys for the FF’s to use with our local pre-school-age children (we’re now serving more than seventy, and the numbers are still climbing!). Volunteer and Committee Member Zama Vilakazi has been trained as our toy librarian, and busily keeps records and shows FF’s how to use the new toys, puzzles and games. It’s fun for the FF’s and kids to learn with new toys! See more pictures of kids playing with toys from the library on our facebook group page! Search for Dalton Education Trust under Groups, for updates & pictures of our projects, wonderful volunteers, and adorable kids. 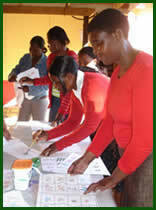 The ground has broken, and building has begun on FF Prisca Ndlovu’s crèche! In a concerted community effort, Dalton Private Reserve is donating building supplies, the local Councillor is donating roof tin, the Municipality donated land with quite a scenic mountain view of the Bushman’s River Valley below Ezindikini, and community members led by Mduduzi Mchunu began digging and planting poles on March 20 so the crèche will be included in the current electricity-mapping of the community. Dalton Education Trust is now a registered Eco School, a program run in 47 countries around the world, and by WESSA in South Africa. We’re busily beginning to adapt the eco schools framework for our informal crèches and excited to promote environmental education with the kids! As a new organization, we appreciate any and all support. Sadly, we are rapidly working through our seed funding, and really need support to keep our projects going! Befitting the nonviolent foundation of psychomotor training, Dalton Education Trust and Dalton Private Reserve have been engaging in extensive conflict resolution and negotiation trainings to facilitate community-building within Dalton and the surrounding communities. The more collaboration and communication, the happier and more productive the participants, and the more good ideas we all benefit from! We have Dalton Education Trust t-shirts for sale! All sizes and colors, made with our kids, just R50 each! Tree front, logo back. Also, we’re selling psychomotor equipment locally by order. The brochure is available on our website. Dalton Education Trust only exists because people like you care about supporting children. We especially want to thank: Margaret McKenzie, Phelelani Mabaso, John Dawson, Easy2Use, Sterley & Dawson, LETCEE, PEISA, Yizwa, ITI, Koop Design, Imbabazene Councillors, our FF’s and Committee members, Joe Dawson, Lesley Terwin, Sue Dawson, Dalton Private Reserve employees, and so many more kind people who have donated time, money, and services to build a strong foundation for the future of our children.